Some years ago I was travelling in a minibus en route for a day's work as an extra on a BBC TV production. Being of slightly thuggish appearance in this part time job I generally found myself in such romantic roles as "prisoner" "unemployed person" ""loser" or "vagrant" . Today was no exception I was a prisoner and traveling with other male prisoners to the film set. We were all of different ethnic origins. I was white, one was black, one Indian and one who looked Middle Eastern. The mini bus also had female extras who were going to be visiting their men folk in the prison and each woman was also either white, black, Indian or Middle Eastern. There was some laughter when I said that what's the betting I would be paired with a white woman and a black woman with a black man and so forth. Of course on arrival at the set I was correct and everyone in the mini bus sadly knew I would be. This after all was the BBC if multi ethnic, multicultural Britain was now part of the mix in the BBC schedule old ways die hard and when you have a BBC that still, (in the words of former director General Greg Dyke) "hideously white" and dominated by public school/ middle class boys and girls it may take even longer to die. Black with black, white with white and never the twain shall meet. The 2012 Olympics are at an end. Gold Medal Hero and pin up of multicultural Britain Jessica Ennis is undoubtedly a positive symbol of where Britain is going. Yet in the bowls of public sector broadcasting I'm wondering if they are on a different wavelength to the rest of the country or maybe showing who we really are and indeed who we'd really like to be. Not to be outdone, and following the rose tinted interpretation of Edwardian England in Downton Abbey, on the 24th of August the BBC launched a multimillion costume drama called Parades End. An equally high brow sanitized version of Edwardiana and like Downton Abbey is unashamedly awash with impeccable manners, starched collars, Earl Grey tea, cucumber sandwiches and of course showing us all how the upper classes were really so wonderfully nice and understanding to their poor servants. I had previously been certain that Downton and its highly inaccurate portrayal of dear old England was just a one off. However along now with Parades End (and potentially others in the pipeline) I'm gradually concluding that such shows are a counter balance to Britain's decline. The less Britain is relevant on the world stage, the more our military shrinks and the further we drop down the world's listing of leading economies, then the more we cherish our "glorious" imperial past and do so at the expense of the truth. Downton Abbey and Parades End are set just prior to the First World War, a war that radically changed British society. As it was almost impossible to maintain England's Upstairs downstairs world in a muddy trench at Ypres, divisions became watered down and gradually the road to modern Britain was born. To the romantics who will follow Parades End and who do follow Downton Abbey I'm sure there is thus a percentage who view World War I as where it started to go all so very wrong for England. Partly in the fact that the British Empire post war began to decline and partly because Britain became a multicultural society that it still is today. Which does of course sound racist? But then is such TV period drama trying to fight against such a racist stance or go along with it? Undoubtedly the latter with the vast majority of British TV dramas of this period very rarely mention the massive contribution of Indian and other empire troops. They are simply written out of history and we are thus left with an almost completely false image of the past. Downton Abbey and Parades End are essentially examples of escapism. But to escape to a rose tinted world that really never existed, to dream of an England that in so many ways never was seems slightly odd. Downton Abbey has 10 million UK viewers…out of 60 million people that's a fair chunk of the population that are absorbed by their quaint carry on's. 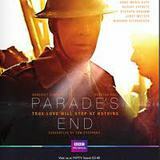 Parades End also has high viewing figures. Is this just a sign that people are interested in good TV drama? If so would they then be still interested if the BBC spent a similar amount on a series on black kids living happily in the countryside? I doubt it, and the hideously white staff of the BBC are probably just not prepared to produce something that they have no interest in watching. Britain is no longer great in the imperial sense but we can still be great in modern vibrant Jessica Ennis sense. Yet there are many that still see such period dramas not as just good TV but a template of how it should be, come to the possible conclusion that Britain now has become a mistake not a triumph. These programmes alone will not of course change Britain but due to their popularity they might have some influence on altering our perception of where we have come from. Which is a shame. In twenty years theses dramas will be seen most probably as overblown and just self absorbed. If reality could have got a look in, and included something of the multicultural Britain that had existed then (albeit if much smaller) the viewing figures could have been greater and even I might have watched more than a few episodes before changing the channel in disdain. Sadly the British in these times of trouble just want fantasy, not reality. They want to absorb fanciful rubbish not truth. I just hope it doesn't stick too much in the mind and that Downton Abbey and Parades End are just introductions to history and learning on that period and not the be all and end all of how it really was.